We all knew with the success of Sylvester Stallone’s ‘The Expendables‘ films, that there was eventually going to be a female version. It was only a matter of time. We’ve even talked about it on this site before. Well, we aren’t too far off from some big news regarding this project. 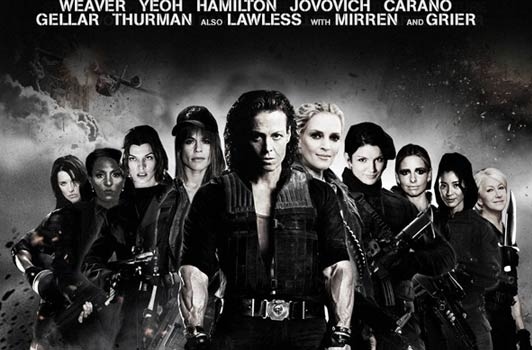 Millennium Films chief Avi Lerner, who has released the past ‘Expendable‘ films, is making ‘The ExpendaBelles‘, which again is virtually the same film as Stallone’s, but with females. And since Lerner wants to film in Bulgaria (it’s cheap to film there), he released a little glimpse of info to the Bulgarian press, in hopes that it wouldn’t make it to the states. Wrong. We hear that Meryl Streep, Milla Jovovich, and Cameron Diaz are being courted to star in the film. The script is finished and was written by Karen McCullah Lutz and Kirsten Smith of ‘Legally Blonde‘ fame. Lerner will also be courting a female director. However, no casting decisions will be finalized until a director is on board. And is highly suspect that after a director is chosen, a few big name stars will also be added to the above mentioned names including Sigourney Weaver, Linda Hamilton, Geena Davis, Katee Sackhoff, Gina Torres, and possibly Uma Thurman. I would love to throw Linnea Quigley in there for good measure. Hell, we even made a TOP 20 Female Badass List recently. Check it out HERE!!! This entry was posted on Monday, October 28th, 2013 at 11:23 pm	and is filed under Film, News. You can follow any responses to this entry through the RSS 2.0 feed. You can skip to the end and leave a response. Pinging is currently not allowed. « Emile Hirsch to Play John Belushi In Biopic!! !